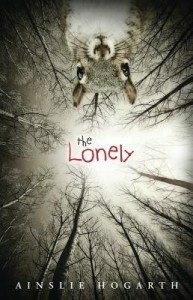 Fourteen-year-old Easter struggles with a mysterious condition she calls “The Lonely,” which affects all of the women in her family. One day, after Easter sees “Something Terrible” at her house, she runs into the nearby woods and is promptly crushed by a giant boulder, pushed by her sister Julia. The only problem is that Julia isn’t real – she’s an imaginary sibling created by Easter to help fend off The Lonely. The rest of the novel alternates between Easter reflecting on her short life and describing her current predicament as she lies on the ground calmly bleeding to death and hoping for someone to rescue her. It’s difficult to pinpoint reality versus hallucinations (or outright lies) in Easter’s narration, as she admits to being a chronic liar who can’t even tell which of her memories are real. What’s clear is that The Lonely causes her to suffer from low self-esteem and gives her a sad, sick view of the world: she imagines Julia dying a dozen different ways, from falling off the roof to choking on bits of her own teeth to being crushed by the contents of their grandmother’s basement. There are times when Easter’s unlikely optimism about being stuck under a rock is oddly amusing: she appreciates the way the boulder shades her face from the sun, and she happily watches a nearby squirrel eat a discarded cheeseburger. However, Easter’s flashbacks show how mean-spirited she can be, and The Lonely contains too much darkness for most to embrace. Only readers who revel in gruesomeness and the bleakest of humour will want to give this esoteric novel a chance.